Welcome to our mock draft. This season, we brought some of our best writers together and completed a full, two-round, 62-pick mock draft. It’s going to be so great that we’ll get every pick right without exception. Now if you believe that, it might be time to get your head examined. Mocks never go the way the real thing does. Our hope is to give you some insight into what our writers are thinking along with a look at what decisions your team could be facing in a certain spot. If you want to see Central Scouting’s final rankings, go here. Now that we’ve cleared that up, let’s get to our mock. We have 62 picks to do. Oh and by the way, this is a straight draft with no trades. Let’s get started. 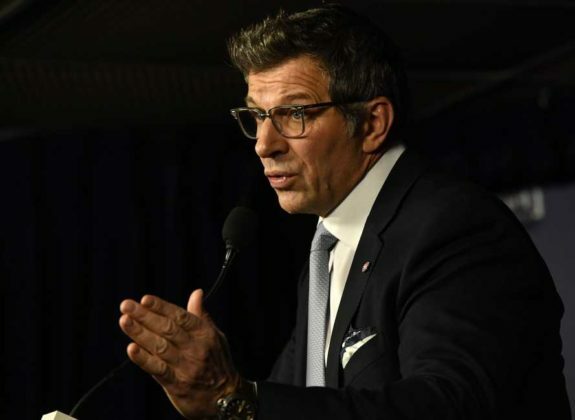 Marc Bergevin and the Montreal Canadiens are now on the clock. Wink. Hands down, Dahlin is the top player in the 2018 Draft. Combining the way that he orchestrates a play with his overall vision on the ice, he is a generational defender that we have not seen the likes of, arguably since Nicklas Lidstrom. With all due respect to Pierre Turgeon and all other high selections Buffalo has made over the years, no draft pick has had as much meaning to the Sabres since Gilbert Perreault when the franchise first began. This is a no-brainer pick for the Hurricanes. After many years of taking defenders early on, they get a player in Svechnikov who scored 40 in his draft season. We should expect to see him wearing the Hurricane logo in an NHL regular season game come this October. The selection of Filip Zadina made the most sense for the Montreal Canadiens despite the team’s need for a No. 1 centre. Arguably the best player in this draft class not named Dahlin, Zadina has the potential to be a Day 1 starter. Playing in the QMJHL, albeit in Halifax, makes Zadina familiar with the province of Quebec as well. The Sens were tempted by some of the high end defensemen on the board but couldn’t pass up a big power forward like Tkachuk. Tkachuk is close to NHL ready and will provide the Senators with some grit and feistiness in their top six for years to come. 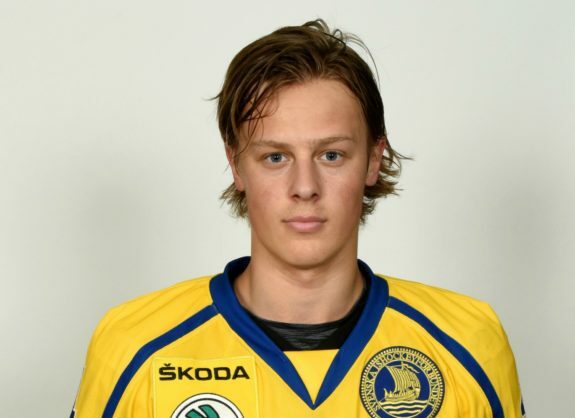 The Arizona Coyotes have decided to select defenceman Adam Boqvist with their 5th overall pick. Boqvist represents the new wave of defencemen under six-feet that can transport the puck effectively while possessing a strong skating ability. With their 2017 first-round pick, the Coyotes selected left-handed defender Pierre-Olivier Joseph who will be a great compliment to right-handed Boqvist. With Boqvist taken the pick before, the Red Wings will turn to London blueliner Evan Bouchard at No. 6. Detroit needs a high-quality, top-pairing defenseman and Bouchard fits the build. The Oakville, Ontario-native is a right-handed shot, can run the power play, and may be the best passer in the entire draft. In 67 games with the London Knights, the all-situations defenseman produced 82 points, including 25 goals. Bouchard could probably crack Detroit’s roster next season, but would benefit from another year of seasoning at the OHL level. With Adam Boqvist and Evan Bouchard off the board, Jim Benning and the Canucks staff should be jumping for joy if Quinn Hughes fell into their laps at seventh. The 18-year-old has an elite skill set and could end up being the best offensive defenseman of his entire draft class next to Rasmus Dahlin. In a few years Hughes could be to Vancouver what Charlie McAvoy, Seth Jones, and Zack Werenski are to their franchises. Needing a center, Jesperi Kotkaniemi is just what the doctor ordered for the Blackhawks. The Finnish pivot is a creative playmaker, projects as a top-six forward in the NHL, and is probably the top center in the draft. After a strong showing in Finland’s top league (29 points in 57 games) during his draft year, Kotkaniemi is expected to play another season with Assat Pori before moving over to North America. As Kotkaniemi develops, he’ll slot in perfectly behind Jonathan Toews as Chicago’s No. 2 center. Wahlstrom is a highly skilled forward who possesses elite level puck skills with a high hockey IQ. He already has NHL size and is a fierce competitor. He is a threat to set up teammates or create offense for himself. Dobson was an absolute stud at the 2018 Mastercard Memorial Cup leading Acadie-Bathurst to a championship. He projects to become a top-three defenseman in the NHL and would solve the Oilers need for a puck-moving defenseman who can also quarterback their power play. Dobson may still be filling out his 6-foot-3 frame, but he’s NHL-ready and plays a similar style to Alex Pietrangelo. A helluva pick for Edmonton. Assuming John Tavares re-signs with the Islanders, they need to add skill on the wings. In Kravtsov, you get perhaps the best combination of pure skill and size available in this part of the draft. Oh and he has great hands and can skate well. Now that they got their skilled-winger in Kravtsov, the Islanders need a puck moving defenseman. They get that with Wilde. Although he plays a risky game, he is effective in all three zones especially with the puck on his stick. He can also quarterback a power play. There’s just a lot to like about his upside. 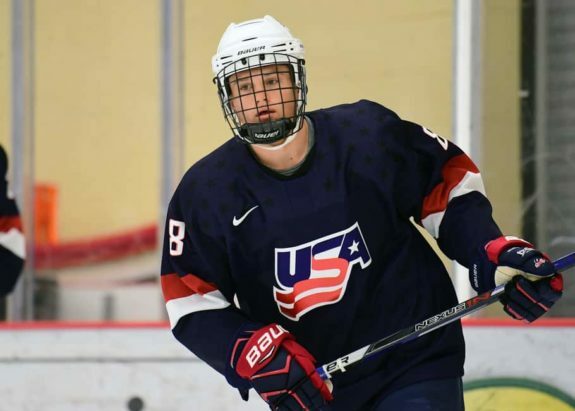 A versatile winger with great speed, Farabee is coming off a great season in which he captained the United State Under-18 team. He excelled as a playmaker and penalty killer and projects as someone who can be responsible in all three zones at the NHL level. You can never have enough center depth. In Hayton, the Flyers get one of the smartest players in the draft. He can also play in any situation. 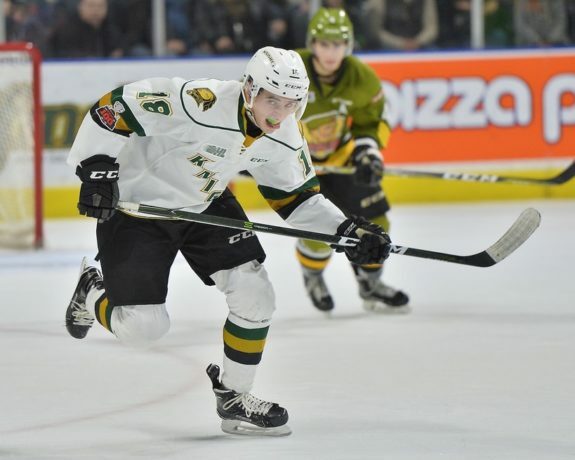 Hayton would join his Soo Greyhounds teammate Morgan Frost in the Flyers’ organization. For a team without any high-end defensive prospects like the Panthers, Smith is the perfect selection. A great defender in all three zones, Smith brings smooth skating and cool-headed play to a team in desperate need of more reliability. The Colorado Avalanche have selected centre Joe Veleno with the 16th overall pick. With already three years of major junior experience under his belt, Veleno has seen his draft stock plummet after a season that would be best described as up-and-down. Granted exceptional status in 2015, Veleno remains a wildcard because of the raw, abundant skill that is there. With Tyson Jost, Mikko Rantanen, & Nathan MacKinnon all under the age of 23, not to mention Cale Makar and Conor Timmins with their first two selections last year, the Avalanche can afford the risk. The Devils land a player in Noel that has a rare combination of size and scoring sense. He’s 6-foot-5 and one of the youngest players in this draft. He has the upside to become one of the premier power forwards in this league. At this point in the draft, you take the best available player regardless of position. In my mind given who’s off the board, Denisenko is that player. He’s a skilled winger who can rapidly fill the net and projects as a top-six player at the next level. Can’t do much better than that 18 picks in. The Flyers continue to build a solid foundation of prospects with the addition of Miller to their blue line. He’s a big defenseman who plays the body well and is an effortless skater to boot. He’ll crush you one moment and quickly play the puck the next. The Sharks need speed down the middle and McLeod can provide that. He’s elusive with the puck and is the type of playmaking center that can carry a line. His 6’2” frame is just the cherry on top. The Sens grabbed who they believe to be the best player available at this spot in the draft. 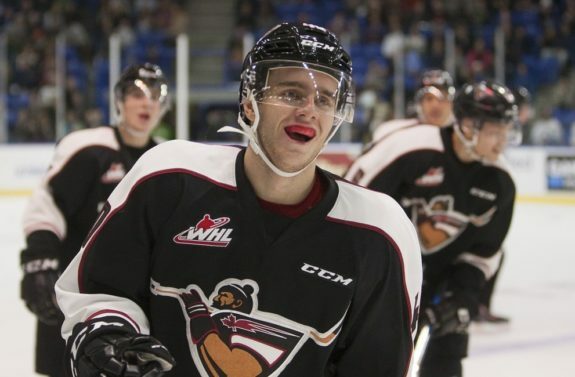 The team gave up a young centre prospect in Shane Bowers as part of the Matt Duchene deal and hope that Kupari’s upside can help soften that blow. Bokk is a highly-skilled winger who could be the best player to come out of Germany since Leon Draisaitl. At 6-foot-1 and 170 pounds, the 18-year-old Bokk has a solid frame he can continue to grow into. Perhaps more importantly, his strengths entail his lethal shot and his ability to beat defenders one-on-one, which are attributes the Ducks could use on the wing. In 35 games with the Växjö Lakers of at the SuperElit level in Sweden in 2017-18, Bokk tallied 14 goals and 27 assists, demonstrating playmaking abilities to go along with his shooting skills. He then picked up one goal and one assist in 15 games after moving to the SHL. Bokk should continue to develop and could end up being somewhat of a steal at No. 23 overall. He does need to work on his strength and skating ability, but much of that should come if he is able to add muscle and train diligently. At the end of the day, for the Ducks, adding another right-shooting sniper to eventually complement Rickard Rakell could eventually create a major matchup issue for teams down the line while also helping the club transform into more of a skill-based team than one predicated on toughness and physicality. Ranta is one of the purest skaters in this draft class and will benefit the Wild with his speed and skill. He is a natural goal scorer and if he can provide scoring at the next level then he will be able to step in and compete for a roster spot in 2018-19. The Finnish native has a huge upside and the Wild will help mold his game into the offensive component that they need. With Sandin, it gives the Leafs more depth on D in their system – something the team still lacks in. If they can add quality defensive prospects they can continue to streamline quality defensemen into the big leagues on a regular basis. Effective at both ends of the ice, Kaut had a bit of a coming out party at the World Junior Championship. He notched seven points in as many games in a playmaking role. He is equally effective in finishing around the net. Having already taken a center at No. 8, the Blackhawks would then turn their needs to a defenseman with the 27th-overall selection. Jared McIsaac’s stats may not wow you, but the talent is certainly there. While still managing to produce 47 points in 65 games, McIsaac was trusted to be Halifax’s shutdown defender in the highly offensive QMJHL. He plays a physical game and is one of the better blueliners in the entire draft in his own end. Addison is an outstanding skater who plays a strong two-way game. He has good vision and can quickly transition from defense to offense. He is a threat to join the rush and pinch at the blueline while his skating speed and pivot allows him to get back defensively. Though not overly tall, Jett Woo has a solid build at over 200 pounds. While he can move the puck to a fair extent, what will make him enticing to the Blues is his physical game and his affinity for throwing hard hits. Woo’s positioning is sound, and he does not shirk his defensive duties when he throws his weight around. With their second first-round pick, the Red Wings could opt to take a forward, having already chosen a defenseman (Bouchard) at No. 6. In Akil Thomas, Detroit would receive a playmaking center with a right-handed shot and top-six potential. 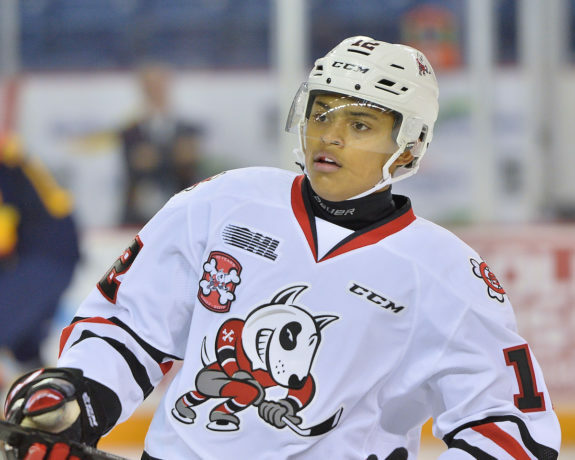 During his second season with the OHL’s Niagara Ice Dogs, Thomas produced 81 points in 68 regular season games and added another 11 points in 10 playoff games. The six-foot center has great vision around the ice, which would explain why 65 of his 92 total points came as assists. Detroit could certainly use a puck-distributing pivot to slot in behind Dylan Larkin on the depth chart and push Michael Rasmussen to the wing, where he may be better suited. For the Stanley Cup champions, taking a known-winner in Jacob Olofsson is a no-brainer. Washington tends to favor centers and Olofsson is just that. He has an excellent shot, is an esteemed playmaker, and can play in all situations. Olofsson’s knock is that his skating is average at best and still needs to work out some kinks in his own end. However, the Swedish pivot has tremendous hockey IQ. There’s still work to be done, but Olofsson can eventually turn into a productive NHLer, likely topping out at an all-situations, middle-six forward. Buffalo needs wingers, and Jonatan Berggren looks to be a darn good one. Anything he lacks in size is made up for in his speed and his ability to be a sniper. Though Berggren shoots lefty, he is comfortable on the right wing – much like Alexander Mogilny once was for the Sabres. Though there is no indication that Berggren will make an immediate jump to the NHL, this is a highly skilled prospect for Buffalo who will have an impact within the next couple of years. Considering how talented this kid is, choosing Ryan Merkley could pay off huge for the Red Wings if the defenseman’s troublesome personality traits are behind him. Merkley has been seen as this year’s most polarizing draft-eligible prospect – something that Detroit typically stays away from. However, there’s no denying his on-ice abilities. Merkley is up there with Dahlin, Boqvist, and Hughes from an offensive stand put. Having both Bouchard and Merkley on the point in the future would provide the Red Wings with two power play quarterbacks and plenty of firepower from the blue line. Hopefully, his offense shines and his attitude is not offensive moving forward. Further developing their defensive prospects, the Panthers select Samuelsson based on his proven defensive ability. He has strong hockey IQ in his own zone and already is a huge physical force that will eat up minutes on the blue line. The Canadiens are selecting Jack McBain because of the teams dire need at the center ice position. While McBain may still need to fill out his frame and work on his consistency and skating, his upside is that of a legitimate top-six center. His size is appealing as well. You can never have too many centers. With his high hockey IQ, Ty Dellandrea would bring some offensive punch to the Red Wings’ lineup. 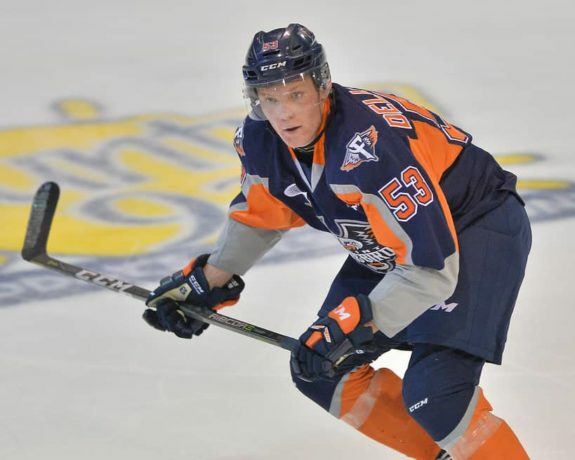 Sporting a 27-32-59 stat line, Dellandrea was the go-to center for his Flint Firebirds team and was tasked with going up against the top players from other teams. While he produced in the offensive zone, there’s still work to be done around his own net. Whether or not you put stock into the plus-minus statistic, Dellandrea’s minus-30 rating does stand out, though his team was not very strong there as a whole. Perhaps placing Dellandrea on the wing to start his professional career could maximize his offensive output while masking his defensive deficiencies. Canucks got a good offensive defenseman in the first round, in the second they’ll add an underrated two-way forward that could develop into a top three center down the road. An eventual top nine that might include Elias Pettersson, Bo Horvat, Brock Boeser, Jonathan Dahlen, Adam Gaudette, and McShane would give Vancouver a solid foundation to build upon for their future. The Canadiens will work on replenishing their defensive prospect pool by drafting a responsible two-way player in Johnny Tychonick. While he has flaws (every prospect does, especially those who fall out of the first-round), Tychonick’s upside is too strong to pass on here. A skilled two-way center, Groulx plays a highly competitive game. While some question his offensive production as he was often paired with elite prospect Filip Zadina, his ability to compliment a star player while being sound defensively should make him a strong complimentary player for highly skilled wingers the Rangers are developing in their organization. Oiler fans can rejoice if they were able to land both Noah Dobson and Bernard-Docker in the 2018 NHL Draft. Bernard-Docker has great offensive skills and might be one of the best Junior A prospects available this year. He’s committed to a powerhouse program out of North Dakota in the NCAA next season, so Edmonton can take their time letting him mature. All in all, a great start to the draft for the Oilers. The Islanders need defensive prospects and there might not be any better shutdown defenders in this draft than Ginning. His offense is a work in progress, but he does an excellent job at preventing the puck from going in his own net. He’s also a good skater for someone his size. A lot to like here 41 picks in. Foudy got his opportunity to shine in London after all the trades and the Hurricanes took notice in round two. Foudy is arguably one of the best skaters in the OHL and demonstrates excellent poise with the puck in all situations. He still has plenty of developing to do but is on a good path to have a solid career. The Islanders also need to boost their goaltending and do so by grabbing perhaps the best one available in this draft in Rodrigue. What stands out is how quick he is especially going from side to side. He has a history of highlight reel saves, something the Islanders will surely welcome. You can’t help but be intrigued by Bahl and his imposing 6-foot-6, 230-pound frame. 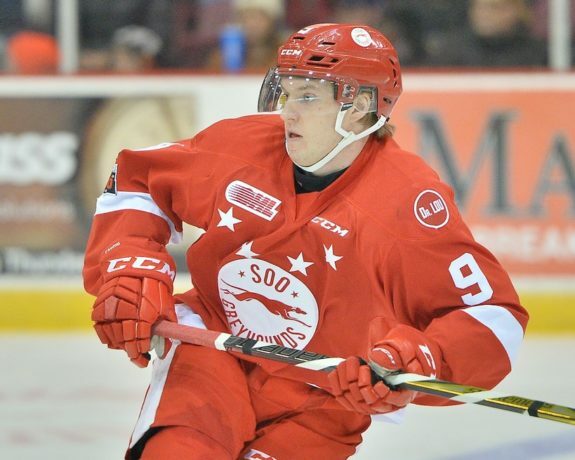 The Ottawa 67’s rearguard continues to grow into one of the OHL’s top shutdown defenders. His offence needs some work, but he has scored in big games such as the Ivan Hlinka final, CHL Canada/Russia Series and CHL/NHL Top Prospects Game. Perunovich is definitely smallish, particularly for a blueliner, but has a dramatic upswing in terms of his offense. He was instrumental in bringing an NCAA Championship to the University of Minnesota-Duluth in 2018 as he the entire team in scoring with 36 points (11 G, 25 A) in 42 games. Given his size, position and Minnesota upbringing, Perunovich will remind fans of Phil Housley. No reason to think that he is not the best college player in this draft. Having already taken a center in the first round, the Capitals would likely want a defenseman with the next pick, especially if that player is the best available. Blueliner Alexander Alexeyev would be a solid pick for the champions mid-way through the second round given his potential. The Colorado Avalanche decide to select their second forward from the draft announcing Riley Sutter would be their 47th overall pick. Sutter, who is widely considered a late-bloomer, projects to be a safe bet to find a niche as a bottom-six forward. Colorado, who possess the skill listed above, could use a heavy bottom-six presence. Lundkvist is a puck moving right handed defender who is a decent skater with good offensive instincts. He defends well off the rush using an active stick and is agile enough to stay with attacking forwards. In his first pro year in the SHL, he impressed his coaches enough to gain minutes and appeared on the team’s power play. The Blue Jackets are thrilled to welcome the best prep player in the draft to the fold. He’s a playmaking center who has no trouble filling the net. He’s also an above average skater. If he lasts this long, he would become one of the steals of this draft. A tenacious player who loves to score? Just what Flyers’ fans love. Drury can play in any situation and knows just one way to play the game. Hard and with passion. He’ll quickly become a fan favorite. As for McLaughlin, he provides depth on the wing for the Maple Leafs organization. He is a skilled forward with a decent ceiling and has good speed. While he’s a smaller player, the Leafs have had success in developing smaller guys – namely Mitch Marner. The Penguins need skilled wingers. They get that with Jenkins. After a slow start, he became one of Saginaw’s best players. He’s an above average skater who knows how to finish. Oh and Sidney Crosby would be feeding him pucks. In selecting Lauko, the Ducks reach back into the well of the Czech League’s Pirati Chomutov team—the same club for which Ondrej Kase once played. Lauko, a center/wing who turned 18 in March, put up a seemingly pedestrian 3-6-9 stat line for Pirati Chomutov in 2017-18, but he was competing against experienced, grown men. At 6-foot-1 and 172 pounds, Lauko should see better results against tough competition once he builds upon his frame a bit more. Perhaps Lauko’s best attribute is his speed. That and his soft hands make him a player with great offensive potential, but he also does not take shifts off and uses his skating ability to hustle on the back check responsibly. Given his talents, Lauko represents a strong value pick late in the second round. The Arizona Coyotes select forward Florida Panthers 2016 2nd round pick, Adam Mascherin. After failing to reach an agreement on an entry-level contract, Mascherin was re-entered the draft and with a glut of forward prospects already, this appears to be a low-risk high-reward pick. 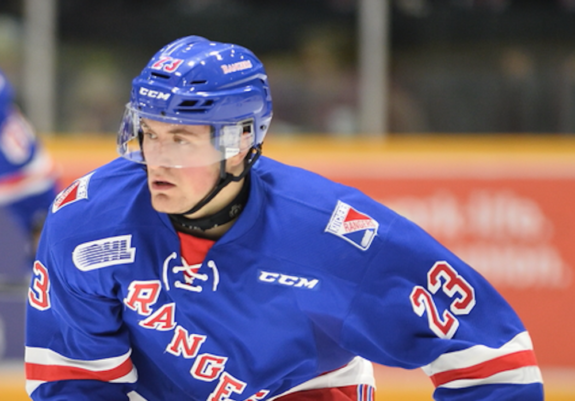 The Canadiens are selecting a forward who could be the steal of the draft in Cam Hillis. While he needs to build some muscle mass to fill out his frame and work on his defensive game, his offensive game is simply too strong to pass up at this stage of the draft. The Bruins are selecting a Massachusetts-native in Jake Wise who is committed to playing for the Boston University Terriers at the collegiate level. His combination of skill, speed and hockey IQ make him the ideal Bruins pick as he fits exactly what they look for in a center. After their first two selections being forwards, the Avalanche select defenceman Filip Johansson. The right-shot defenceman is viewed as a long-term project but can find a steady spot in the future with an Avalanche team that like to play a quick style of game. Adam Samuelsson is the type of blue-chip defensive prospect that the Lightning always want to have in their system. While he is far from a sure bet to make the NHL, Samuelsson has the size and skill to develop into a player that can have an impact on the team. Milos Roman is one of the most naturally gifted offensive players in this entire draft class. 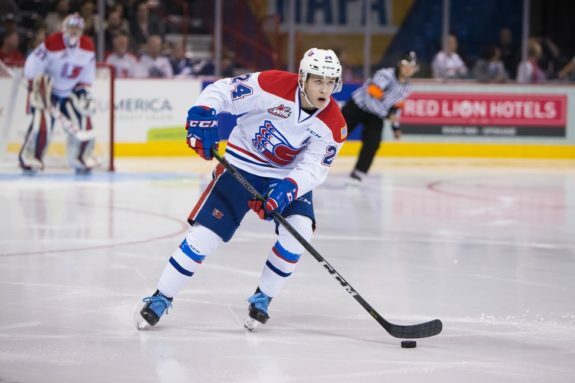 Given the Winnipeg Jets love for home-grown dynamic players, Roman could be a bargain for them in the second round if he can learn to shoot a little more, especially with a need for center coming up in a few years in Winnipeg. The Golden Knights love speed and skill, if their first year is any indication. As such, it would be silly to pass on a player like Niklas Nordgren who, despite being undersized, has all the makings of an NHL player given his skill and accountability. The Canadiens are going the home-grown route by drafting Nicolas Beaudin. 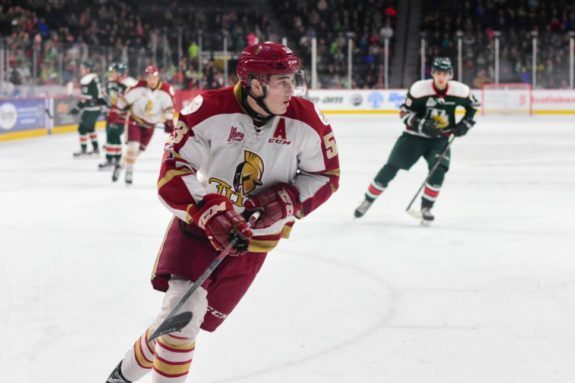 As an offensive specialist who has dominated at the QMJHL level, the team will work on fixing his defensive tendencies while letting him excel offensively. And there you go. 62 picks. How did your team do? How did our writers do? Feel free to leave your comments below. Happy draft time everyone.